This kind of clothing is not for hunting.... They just wear it in a ceremonial or whenever there is a dress-up.... It seems to me that we just owe everything to the ancient times, to our ancestors. They had beautiful clothes. 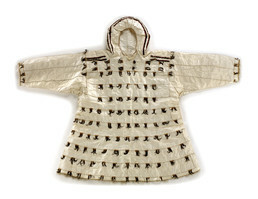 This ceremonial parka is made of winter-bleached intestines from a bearded seal or walrus. It is decorated in a man’s style, using plumes and beak parts from crested auklets. Baby walrus fur was applied along the bottom edge, dyed seal fur to the chest, and strips of seal skin around the hood. People dressed in this style of parka for religious ceremonies such as Ateghaq, a spring ritual to ask God (Kiyaghneq) for good hunting, andKamegtaaq, a thanksgiving that followed the hunting season. John Apassingok: Sanightaaq? Samun atuuwat qaliiraaghwat. Elaine Kingeekuk: Taakuk sanightaaghek ayveghem ighneghlluganeng uliimaaghuuk. Merlin Koonooka: Liigiksalghiinga whanga elngatall megnunaghluki aflengakayuguftut. Iimwaaghluki qantaghluki naqam qelquumaqegkangit angyamun samun hunting-emun unangniighmun. Enkaam wetku aatelleghqii anuqa kaatestaaghanghagu aqlaghami. Enkaam ghhutegpenateng aghneghtekaayuget unangniighteput taagegkut. Enkaam taakut sukilpaam melqughhii naasqumqun qaaynganitkayuget nekeghquumakangit uziimun. Elngatall pinighllapiglluki talwa sugruggaan nuvukruggii nekegsimakangit. Enkaam sami iviighmi atumi sami aatkayuguftiit wetku. John Apassingok: Sameng qiipaqaqat imaani? Merlin Koonooka: Kakisineng talwa pinighataghaghtut. Lydia Apatiki: Sivukluki ighneghllugetqun process-eluki. Elaine Kingeekuk: Ghevngwaaqata aawiitngwaaqata ghhuughluki eslami. Vera Metcalf: Naten tagkaan eslametestaqat? Lydia Apatiki: Esghaghaqluki qateghpagtaneghmeggni kiinghaqii. Lydia Apatiki: Nayemlluki whaten. Temngi legan ghhughluki saagsigatiit. Wiin nayemlluki nengqaghragluki piiqiit. Ralph Apatiki, Sr.: Angukaqaqa neghipigllunga mekelghiighhaalunga. Ayuwitepiglleghiit qilut whaa maaten atuulghiit paniinang. Estelle Oozevaseuk: Sanightaaq [fancy gut parka], the men’s fancy parka. This kind of clothing is not for hunting or anything. They just wear it in a ceremonial or whenever there is a dress-up. They have good clothing for dress-up time. It seems to me that we just owe everything from the ancient times, from our ancestors. They had beautiful clothes. This is a men’s pattern, and women had a different kind. Also I see that whoever made this [sewed] very good seams, very even. I was only three years old at the time, but I remember that my mother did not make anything [on her own], only under the direction of her mother-in-law, because her mother had died. And it seems to me like some of them have a different pattern. There used to be some with this [vertical strips] on the sleeves too. When they go like this [put sleeve to body of parka], it matches to these [horizontal strips on body of parka]. When they put their arms down, it just matches. Somebody made this one without that. Suzi Jones: Do you know which clan or which tribe this style is from? Estelle Oozevaseuk: It seems to me like ours from the Kookoolik area, from the eastern side. That’s the main place where our ancestors lived. We have a good pattern. As you know, I have told the story about how they died [see story section]. Estelle Oozevaseuk: I think this is maklak [bearded seal] intestine. It took a lot of work to do that. We just cleaned the inside out—pour some water in and take it out so many times. And we use our thumb fingernail to take the outer part off. Then when it’s done, we turn it inside out. It took a lot of work. And then we scrape the inside very gently. When done, we put them in water and try to swell them up—my grandma taught me to fill them up with water and just go like this [lightly tip bowl back and forth]. And they get water logged. Then we would wring them, and the water turned red. And we changed it [water] so many times, so many times, until the water turns clear. Then she took them out in wintertime and blew it up. And when they freeze she held them like that [wrapped around outstretched arms], tied them up and tie them up on the meat rack. And they stayed there for a long time. The coldness turned them white. Ones that had not been cleaned in the water [enough] turn out to be a kind of yellow or reddish color. Walrus is not good for this kind, only the bearded seal intestine is good for dress-up because they’re thinner. Walrus intestine is tougher and thicker than these and wider. Female walrus intestine is thinner, better. Bull walrus is hard. And they always put a string around that place [inside hem of hood opening] for them. They put whale sinew or reindeer sinew [they got] from St. Mary people. They used them [reindeer sinew], because they are softer than whale sinew—braided [sinew]. I still do that for the, my son’s boats, braiding [sinew]. Estelle Oozevaseuk: This has been trimmed with auklet tufts with the little orange thing [plates] on the auklets. They saved them. My grandma was too much for me! She always made me—even when I was a little girl—stick them on cardboard or plywood, and when they dry, they just fall off. Some of the trimming [bottom of parka] is baby walrus skin. The hair is not dyed. When they have to dye those, they just put them in a small boiling pot and put in between the kind of tree bark that the sun has turned red. This is the color [two horizontal, red-brown bands at shoulders]. Branson Tungiyan: Sameng melquqat ukegkut? Estelle Oozevaseuk: I think it’s some kind of bird skin, only the down, not the feathers. And dyed seal skins [two horizontal, red-brown bands at shoulders]. Some of them had dyed patterns. It’s going to be in a tribal pattern. Some tribes have very few with other kinds of skins, like seal skins that is white. Taawa tawaten pighllagmi Kukulegmii uglaghllak yuuk. Aghuliitutkaq napigpenani yuuk nemetutkaq tamaana. Ataasikaghtaan ketfaghaqluteng esnemun tawavek pisqii tawaten. Nuna uka tagiiquq qateghvakegllak, iqangilnguq avangilnguq. Qamagtengngwaaghluni imaa qaamna tuqulaghaatkaq nenglumi. 1. According to St. Lawrence Island Yupik Elder Vera Kaneshiro, a sanightaaq [fancy gut parka] was worn on special occasions and only as a windbreaker, not a rain parka. Two types of plain gut parkas are: an aghsughtaq [bearded seal or walrus gut windbreaker-type parka] worn over a cold-weather parka (fur, birdskin, etc.) in winter time or worn as a layer between an outer cloth parka and an inner, cold-weather parka; and a qaliq [gut rain parka] made from bearded seal or walrus intestines, yellowish in color and translucent. 2. According to Vera Kaneshiro, this process is also called bleaching or winter-tanning, when scrapped skin or intestine is made white in color from exposure to very cold air. To make a sanightaaq, a woman first cleaned the intestines and hung them outside to whiten in the cold and wind. Then she split the intestines and sewed them together with thread made of whale or reindeer sinew. She stitched the seams on the outside for a man’s parka and on the inside for a woman’s. The strips of intestine could be sewn horizontally or vertically, depending on the local style. Men’s parkas were decorated with feathers of the crested auklet (Aethia cristatella) and with small orange plates taken from the sides of the birds’ beaks. Women’s parkas were hung with tassels of fur from unborn seals. The fur was dyed reddish brown by boiling it with larch or alder bark. (3) The bottom hem and cuffs of this man’s parka are trimmed with gray fur that Estelle Oozevaseuk identified as baby walrus. The hood and chest are trimmed with strips of bird skin and alder-dyed seal fur. The finest snow shirts were made on St. Lawrence Island, where both bearded seals and crested auklets are abundant. The garments were traded to Yupik and Chukchi residents of the Siberian coast. (4) In the early 20th century, various kinds of trade cloth—muslin, calico, and ticking—replaced seal intestines as the favored material. The colorful cloth parkas that people wear today are called qaspeghaq or qiipaghaq. In 2001 (see Elders’ discussion), Estelle Oozevaseuk told the story of her ancestors at Kukulek, who perished during the great famine and epidemic that struck St. Lawrence Island in 1878-80. (5) Historical sources and Yupik oral traditions indicate that this tragedy resulted from extremely bad weather conditions, poor hunting, and a deadly disease (possibly dysentery or influenza) that swept the island. Mrs. Oozevaseuk provides a more spiritual interpretation. In her story, the people die because they had been cutting strips of flesh from living walruses, animals upon whom they depended for food. In Yupik belief, this act of disrespect would have offended the walruses, causing them to make themselves unavailable to hunters. In her story, a spiritual leader tells the people of Kukulek to dress in their beautiful intestine parkas and to prepare to pass on to another land. They acknowledge their wrongdoing, receive forgiveness, and die peacefully in their sleep. To learn more about the history of this object, read a report by Smithsonian conservators at http://anthropology. si.edu/accessinganthropology/alaska/gallery_parka.html (copy and paste this address into your internet browser).